Known in antiquity as Lan Xan (Million Elephants) and officially known as the Lao People’s Democratic Republic, the Lao P.D.R. forms a land bridge between its neighbors of China, Vietnam, Cambodia, Thailand and Myanmar. After years of war, this landlocked country is finally experiencing peace and stability but continues to struggle as one of the poorest countries in the world. The Lao P.D.R. is classified as a Landlocked and Least Developed Country (LLDC) and relies heavily on donor assistance. It is estimated that one third of the population (32%) lives below the national poverty level. The life expectancy rates are 59 years (men) and 63 years (female) and the mortality rate for children under 5 years old is almost 10% (2005). 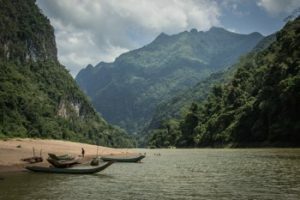 The Lao P.D.R.’s total land area, much of which is mountainous and densely forested, is approximately 237,000 square kilometres. The Mekong River, almost half the length of which flows through Laos, forms most of the border with Thailand. 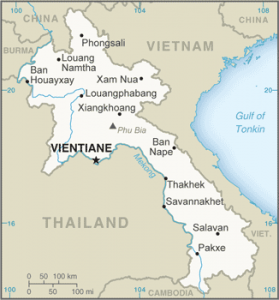 Most main towns (including Vientiane, Luang Prabang, Pakse and Savannakhet) are along the Mekong. The population of the Lao P.D.R. is approximately 6 million people, with an estimated annual growth rate of 2.4 per cent, one of the highest in East Asia. Population density is 23 people per square kilometre, one of the lowest in East Asia. The population is diverse, consisting of approximately 131 ethnic groups. The official language is Lao, a tonal language structurally similar to Thai. Before 1975, French was the predominant foreign language spoken. Between 1975 and 1989, many Lao studied Russian or other Soviet bloc languages. Among younger Lao, English is now the most widely-spoken second language. Theravada Buddhism, the dominant religion of the Lao P.D.R., is followed by approximately 60 per cent of the population, especially amongst so-called lowland Lao. Animism is still widely practiced among a number of minority groups, especially up-country. Laos has a tropical monsoon climate, with a wet season from May to September/October. Temperatures are coolest during December and January and highest in April and May.